[ Offprint, inscribed by the author; Charles Darwin ] Address by C. William Siemens, D.C.L. (Oxon), LL.D. (Glasc. and Dubl. ), Ph.D., F.R.S., F.C.S., Member Inst. C.E., President [ of the British Association]. 33pp., 8vo. Unbound stitched pamphlet. On aged and chipped paper. Apparently lacking covers, on which publication details would have been written. Inscribed at head of first page: 'Mr Stone | from the Author.' Siemens begins by mourning the passing of Charles Darwin "whose bold conceptions, patient labour, and genial mind made him almost a type of unsurpassed excellence". Five copies on OCLC WorldCat. No copy at the British Library. [ Shakespeariana collection of Prof. Wilhelm Wetz of Freiburg. ] Printed catalogue by Joseph Baer & Co. of 'English Langugage and Literature including a Collection of Shakesperiana partly from the Library of the late Professor W. Wetz of Freiburg'. 209pp., 8vo. In printed wraps, with contents page on inner front cover. Aged and with worn spine, on browned high-acidity paper. The catalogue contains 4510 items, with around 10% (472 items, numbered 2041-2513) under the headings 'Shakespeare' (2041-2208) and 'Shakespeariana' (2209-2513), and including sections of 'Separate Plays' (2082-2137) and 'Translations' (2143-2208). The catalogue also contains sections on other notable authors, including Ossian, Bulwer-Lytton, Macaulay, Thomas Moore and Ruskin. No other copy traced, either on OCLC WorldCat or on COPAC. [Printed programme.] Redhill Open Lawn Tennis Tournament (Eighth Year), 1909. C. Stephens, Printer, West Street, Reigate. 1909. 4pp., 4to. Bifolium. 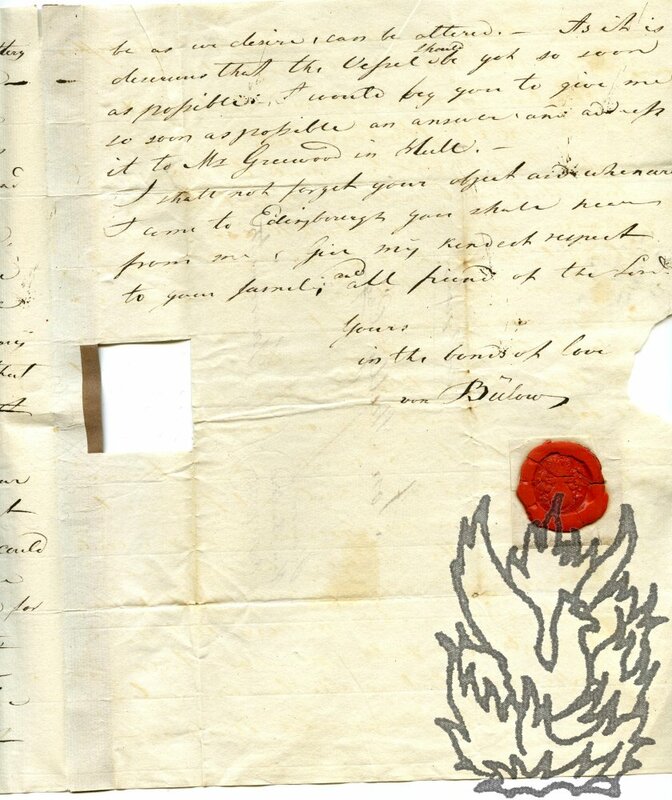 In fair condition, on aged and folded paper. Headed: 'Saturday, 24th July. The Tea to-day is kindly provided by Mrs. Searle.' Giving the scorecard, with names of all participants and results from first round to final, for nine events from the 'Gentlemen's Singles (Level). New Challenge Cup presented by SIR J. COLMAN, Bart.' (F. W. Rahe versus K. Powell) to 'Ladies Doubles (Handicap)' (Miss Harper and Miss Russell versus the Misses Bowyer). Scarce: no copy on COPAC. [Printed pamphlet.] Professor Rein's System of Religious Instruction for Schools: A Paper read to the Rochdale Educational Society, January 20th, 1905. London and Manchester: Sherratt & Hughes. 1905. + 33pp., 12mo. In fair condition, on aged paper, with stamp, labels and shelfmark of the Board of Education Reference Library, as well as stamp 'Supplied for the Public Service'. Three copies on COPAC and OCLC WorldCat. Autograph Letter Signed "Poultney Bigelow" to an unnamed correspondent, about recent activities and his books. Poultney Bigelow, American journalist and author, school friend of Prince Wilhelm (Wilhelm II). [Headed] Reform Club, no date. Two pages, 12mo, good condition. "Since our talk I have been in America; returned - have been to Berlin on a diplomtic mission & only just touched at my club before sailing once more for New York on Wednesday - All my books, &c. are in storage at this moment & I must therefore wait until I onc emore return here for settlement - which will be soon I hope. | I hope you will not be angry at me because of what must have been strange silence on the part of [...]"
Reproduction of a drawing of Charles Dickens by Rudolf Lehmann, from 'R. Lehmann's Portrait Studies', presented in the style of a carte de visite. Printed on a piece of 14 x 9.5 cm india paper, laid down on a piece of 17 x 11.5 cm card, with rounded edges. Aged and faded, but nevertheless a nice item of Dickensiana. A sensitive study of Dickens's face, above a heavily-faded facsimile of his signature. Printed at the head of the card is 'R. LEHMANN'S PORTRAIT STUDIES.' And at the foot: 'CHARLES DICKENS | FRED. 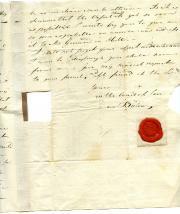 Typed letter signed to "Mr Dandy", a longstanding English friend, in English. Patmore HalI, Little Hadham, Herts, 26 Feb. 1960. 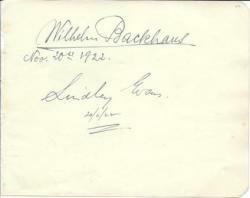 Signed "Frederick of Prussia". One page, slighly creased but suitable for framing. He discusses Dandy's offer of "yet another Motor Cycle, this time a 1914 Triumph two Stroke". He says that his younger son would be "very happy if he could have such a rare Motor Cycle". He doesn't think his older son, Nicholas, is yet old emough to ride the bike already given by Dandy. Pictorial Christmas Card, 8 x 6"
Conventional Christmas Card with winter's scene on front, signed inside "Brigid & Frederick" with greetings and their address (Patmore Hall, etc.) printed. 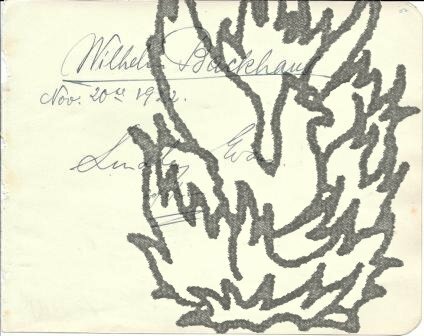 In original envelope which says "Photographs Do Not Bend" suggesting that the card may have been accompanied by a photograph.